In the past it has always been a laborious task to balance Peugeot or Citroen ‘blind centre’ rims. By the time you’ve removed the shaft and fitted the stud plate, you are starting to think that you need to be charging at least £20 to justify the time, hassle and the cost of the adaptor! Well the UniBal solves this problem, and also a few more. 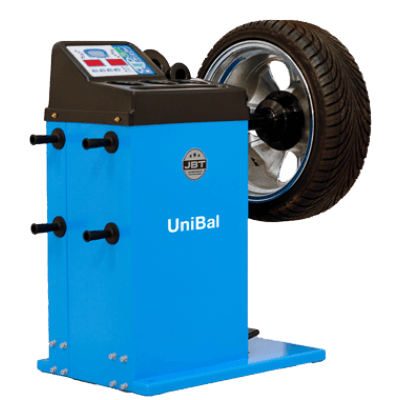 Consisting of a compact, simple handspun balancer that comes fitted with the plate for mounting blind centre wheels, you can now have a dedicated machine that saves you all of the time and hassle. In addition, you can have this machine set up/interchangeable with a motorcycle kit, and even supplied with a conventional shaft and cones meaning you have a back-up balancer should you ever need one. £1,275.00 + vat, Cash Price fitted. £6.17 + vat, per week when using Lease / Buy.